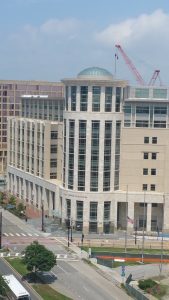 It has been too long since I last posted on the Norfolk Personal Injury Lawyer blog, but I have been very busy taking car accident cases to trial, settling other personal injury matters, and moving into my new office location in downtown Norfolk, right across from the new courts building. Now that I have settled in a bit, I am pleased to report an excellent trial result yesterday in Norfolk General District Court. I represented a young working class man, a mechanic for the military who works on large guns. One day last April he was headed to work, leaving his home on Oceanview Avenue. As he was slowing down to make a left turn, he felt a massive impact from behind him that pushed him forward into oncoming traffic. He hit another vehicle head on, causing him to lurch violently inside his vehicle, a compact pickup truck, and hit his head on the window. In addition to this head injury, my client injured his neck, left wrist, left leg and his chest, the last one probably from the tightening of his seatbelt upon impact. At trial, we proved that a driver of a large SUV was immediately behind my client, but the judge did not find that this driver caused the accident. Rather, she was also an innocent victim of a third driver, who negligently crashed her smaller car into the rear of the SUV with enough force that the SUV in turn struck my client’s pickup, crushing the bed of the truck like an accordion. After causing this pile up, the third driver told my client, “I can’t stay here” before she fled the scene. She did return to pick up her car’s bumper, which fell off due to the impact. My client’s trusty girlfriend came to the scene and drove him to DePaul Medical Center, where triage nurses placed him in a C-collar to protect his spine from trauma. He was dizzy and in pain. There were cuts on his head and leg. Hospital staff took CT scans of his head and neck. Thankfully there was no brain injury or spinal trauma. His chest was x-rayed and an EKG was taken of his heart. Again, thank goodness, the young man suffered no permanent injuries to the head, neck or chest. He and his girlfriend did get to spend the day at DePaul while he underwent various evaluations and was filled with all sorts of medicines, from strong painkillers like Morphine and Percocet to the anti-nausea drug Zofran and the muscle relaxer Flexeril. For several weeks following the accident, my client suffered from left wrist pain. It interfered with his job and his day-to-day life, from maintaining military hardware to driving to simply opening doors. Everything that involved twisting the wrist caused pain. Whatever that means. I argued that my client should not be penalized for toughing it out at work, and fighting through the pain so he could get his work done. And so what if he did not get additional medical treatment? Was the lady who caused the accident and fled the scene offering to give him a ride to the doctor? No! Was she in any position to say how the accident affected him? Nope. She was more interested in picking up her bumper that she left at the scene than she was in anyone else’s safety or quality of life. Not to mention, the whole situation of being slammed in a multi car motor vehicle accident and taken to the ER was no day at the beach. Guess who the judge agreed with? See above! We won the jurisdictional maximum of $25,000 plus 6% interest from last April.